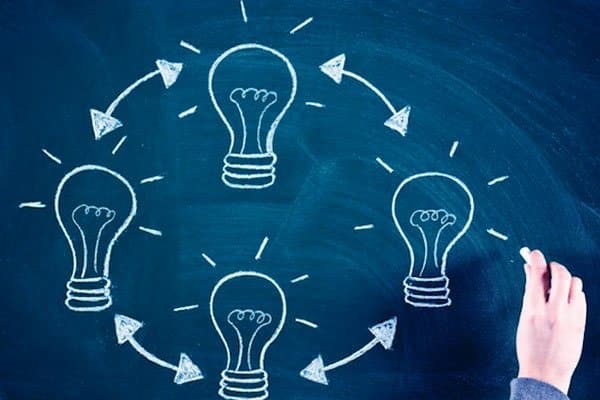 Finding a creative idea is only the first step in every innovation process, understanding the whole picture about business and forecast both internal and external factors that may affect it is critically required before releasing to the market. 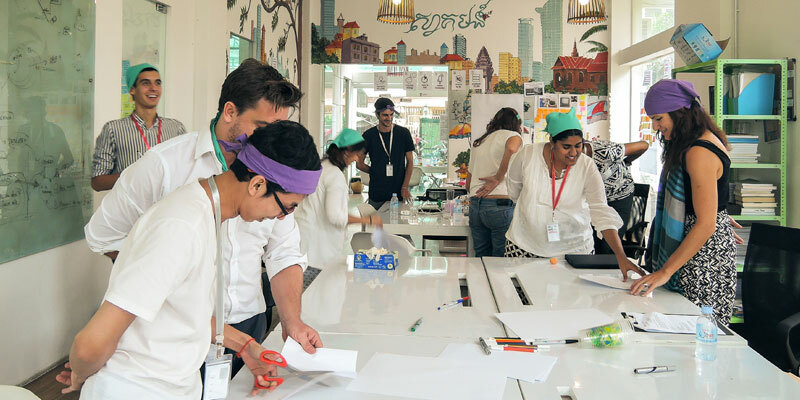 At this point, tools like the PESTLE analysis and SWOT analysis come into action. In a previous article, we explored the SWOT analysis as one of the business tools that can help us to study the business position in the market based on internal factors (strengths and weakness) and external factors (thread and opportunities). However, the SWOT indicated a weakness point to cover all the external factors that may affect the business. What are the PESTLE Analysis Elements? 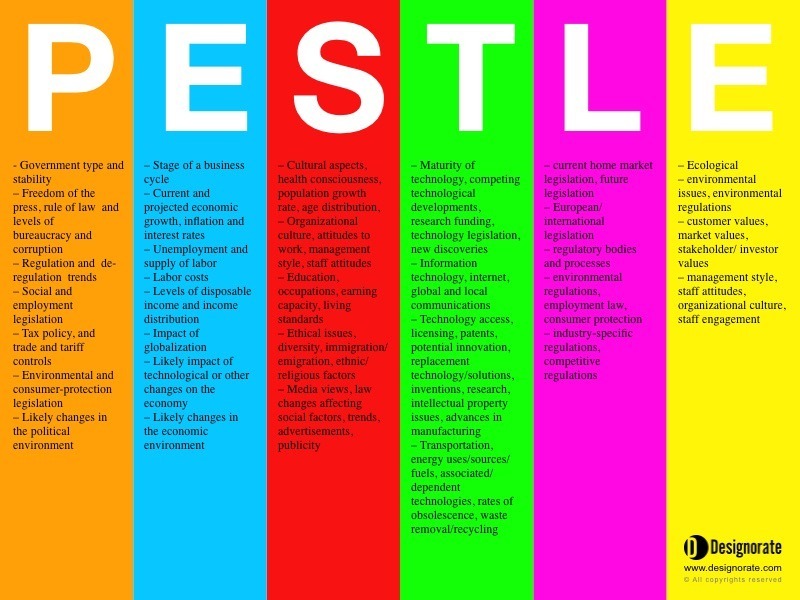 Unlike the SWOT analysis, the PESTLE tool focus on analysing the external factors and their impact on the company. The elements are political, economic, sociological, technological, legal, and environmental. The PESTLE analysis tool can be considered a more detailed version of the SWOT analysis of external factors (thread and opportunities). The political stability for a country is crucial to decide if the company can establish a business in a specific country. While corrupted countries make it hard for companies to operate, bureaucracy can also stand between companies and achieving profit and stable growth. Other political factors include taxes, trade tariff, consumer protection policies, and the chance to change the current country stability. Of course, economic growth, openness, and status contribute to taking any strategic decision for companies. For instance, the cost of labour and raw materials affected many firms’ decision to establish factories and warehouses in cheap labour countries such as China, Panama, and India. The sociological factors are related to the demographic characteristics that effect in the countries socioeconomics such as the population growth, age range, education, attitude and work habits, and living standards. Some of these factors may relate directly or indirectly to the economic factors. For example, the living standard in developed countries is high comparing with the under-developed countries which would reflect on the labour costs subsequently. Technology awareness and adoption have a positive correlation with companies desire for investment. Technological ability in countries includes having a good stable infrastructure such as Internet connection, technological innovation, research, easy patent regulations, electronic laws and regulations. India, for instance, succeeded to attract Silicon Valley giants to open branches there to their development and support offices. Having clear laws and regulations ensures that the companies will get their rights and be protected; in contrast, corrupted countries may not protect companies under the umbrella of the law. Regulatory bodies, employment laws, company protection laws ensure the future security required for business sustainability. The environmental impact becomes an essential part of the international regulations such as the European Union imports. While some countries don’t provide much care to the ecological effects of the industry, this can be a trap for companies. Because the output products will not meet with the environmental regulations required by the importing countries. Below is a visual list of the elements included in each of the PESTLE factors. Why and When to Use the PESTLE Analysis? The challenging part about the PESTLE analysis is that these factors are not controllable. In many cases, we can’t predict the changes that may happen in any of these factors and when. For example, the economic recession in 2007 was not predicted by many companies whose plans were disrupted and event terminated. Analysing the market provides us with information that can help us reduce the risk on companies or projects. 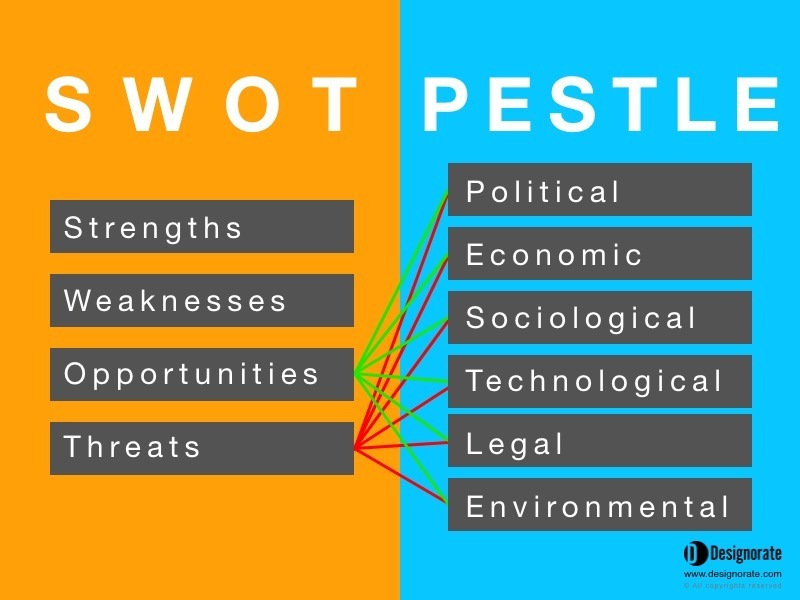 While SWOT analysis doesn’t offer sufficient analysis for external factors that may affect the company, PESTLE analysis can provide us with a detailed insight into different external factors. 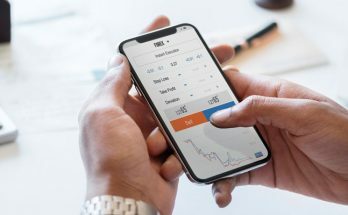 However, the changes in the market especially sudden modifications can’t be forecasted using this tool which makes the outcome of the tool guides rather than an accurate plan.